Extrusive igneous rock is when lava cools outside of a volcano, that is how a volcano forms. That process is called crystalization, and the magma comes from the upper mantle.When the lava comes out of the earth it cools quickly and if the lava cools in less than a day, there is no time for the elements to form minerals instead, the elements are frozen in place with volcanic glass. 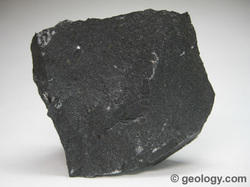 Basalt is the most commen type of extrusive igneous rock, which is shown in the picture.